From the moment I saw the first trailer, I knew I wanted to try Yomawari out. It looked both adorable and horrifying, but I had no idea just how powerful the experience would be. Yomawari is a game from Nippon Ichi Software for the PS Vita. I think it should be classified as a horror game, but what I got was much more. The game centers around a little girl. After both her dog and her older sister disappear, she is left to search through the dark and spooky town for them. Soon it becomes clear that there are dangerous otherworldly things out there in the night. 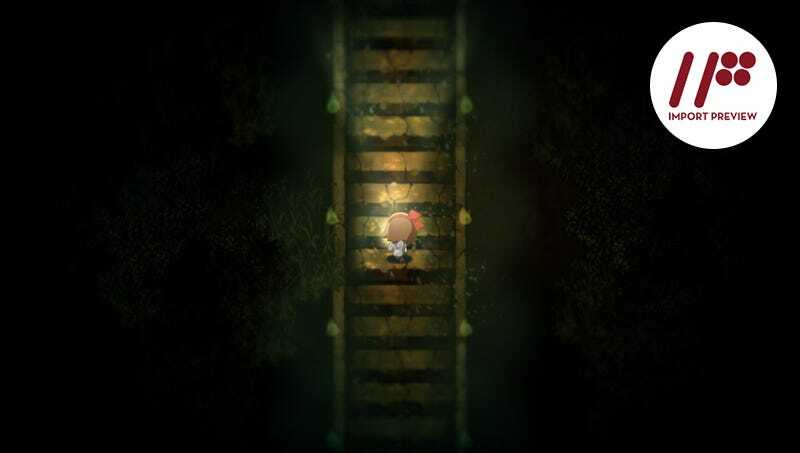 Right from the start, Yomawari uses the juxtaposition of adorable and freaky to great effect. The protagonist little girl is so cute and innocent in design that you immediately feel drawn to her plight. Then there is the setting she runs about in. Dark and foreboding, the peaceful town seems threatening and dangerous at night. The isometric view also helps to make everything seem more beautiful and scary. And then there’s the initial tutorial. It’s already been mentioned, but the tutorial for Yomawari is perhaps the most shocking and affecting tutorial for a game I have ever experienced. Without going into spoilers, the fact that what happens, happens, and that the game pretty much tricks you into making it happen is a masterful stroke of genius I’ve rarely seen. It’s brutal, comes out of nowhere, and immediately makes you part of the story at hand. One of the more affecting aspects of Yomawari is that it is a coming of age story of a little girl learning of mortality—her own and of those around her. Initially she seems almost stupidly ignorant of most of the things going on around her, with only the guidance of the player to keep her out of harm’s way. But as the story progresses, and she continues to encounter and interact with forces from beyond, you get to see the dawning realization on this little girl. The whole thing is very touching and very emotional and gave me flashbacks of watching the Charlotte’s Web cartoon as a child. The colorful palette of creatures that inhabit the world of Yomawari is quite fascinating. Indeed, most things will attempt to kill you when you approach them, but interestingly enough, others are completely harmless despite their creepy or unsettling appearance. That said, the designs of the monsters are unsettling and freakish and never really stop being frightening whenever they show up. The game captures much of the Japanese heart of ghost stories in that many of these beings aren’t good or evil, they’re forces of nature that simply are. There’s no getting rid of them, no pleading that will make them forgive your trespasses, no knocking the bad guy into a pit of fire and then having credits roll. These things are a part of the world just as much as you are and the only solution is to try to coexist without having them kill you. The game’s ending really drives that point home and even after I cleared the game, I spent several hours thinking the whole experience over. If there is a problem with the game it’s that you will die. A lot. By lack of skill or by accident, you will meet your grizzly end again and again. The game takes this into account by saving your progress and letting you keep things you’ve obtained right up to when you were turned into a black screen full of red splatter. Unfortunately, this cycle of try, die, repeat lends itself into some moments of monotony and pattern memorization where you will be trying to navigate the same maze of shadow creatures for the umpteenth time without being slaughtered. For me, Yomawari was a game I had high expectations for that still managed to surpass all of them. From its charming yet haunting atmosphere to a very subtle yet powerful story I absolutely loved my time with it. The game is short by modern gaming standards (about 4 to 5 hours depending on your skill), but as a horror game, it’s a perfect length that keeps it from ever overstaying its welcome and becoming mundane. There’s not much in the realm of replayability unless you want to experience the same story again, but it is still most definitely a game worth experiencing. Yomawari is currently available for the PS Vita in Japan. No word on a Western release, but Nippon Ichi Software tends to be fairly good about these things.